The chef and television personality makes another charming foray into family and food history (Nonna Tell Me a Story, 2010). Nonni Lidia welcomes her five grandchildren into her kitchen to discover that they want to make dinner for their great-grandmother Nonna, who is 92. Lidia tells them about growing up in Istria in Italy, where her family grew or raised much of their food, and the joys of eating by season. 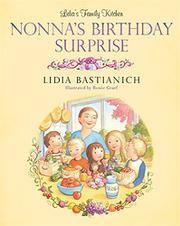 At the local farmers’ market, Nonni Lidia gives each child some money and tells them to buy what seems good to them. With the lovingly described tomatoes, basil, cheese and asparagus the children buy, they come home to make pasta primavera. There is something of an overuse of the word “special,” and exclamation points are sprinkled about with abandon. Still, Lidia’s exhortations about seasonal, fresh and healthful eating and her celebration of the sensuous joys of touching, tasting and experiencing food are evocative and winning. The 18 recipes at the back are excellent; they are aimed at adults and accompanied by a sensible list of what kids can do to assist in preparing each one. Graef’s illustrations are rosy, and the people, animals and foodstuffs are depicted with plump, round edges; all are washed in the golden light of memory.